Man, these Pirates Press vinyls are all really nice, aren't they? The split-color vinyls they do are just positively delicious and the black/white split that this record is on is awesome. (The insert is pretty half-assed, though, so no 5 in the art category). I picked up about half of the Under the Influence series a while back. I went to the Chuck Ragan Revival Tour in '09 and, after that, spent some time buying a lot of Suburban Home records and folk-punk offerings. This split between folkies Andrew Jackson Jihad and punks Cobra Skulls is a nice addition, but not one of my favorites from that era. 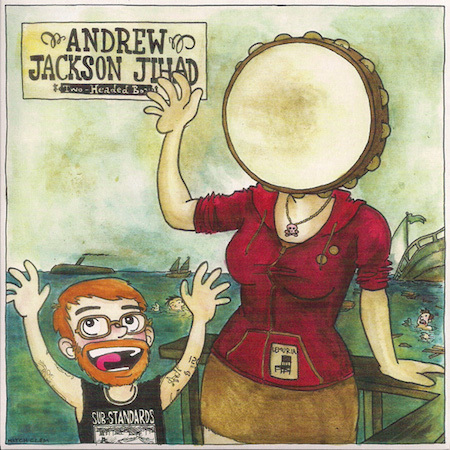 AJJ put down a cover of Neutral Milk Hotel's "Two Headed Boy." For some reason, I don't like Neutral Milk Hotel. I know that I'm supposed to and that every girl I ever dated probably did, but I just didn't get into them. I guess I was too punk at the time I heard them. This cover is more exciting than I remembered the original, but a quick listen tells me it's more of a spot on reenactment. I enjoy the chorus/verse contrast and that harkens to the melodramatic stuff I enjoy, but the outro of random humming is ingratiating to me for some reason. The Cobra Skulls side is more up my alley. I can't stand to listen to Bob Dylan ramble on, but he writes a good song when it's performed by someone else. "Subterranean Homesick Blues" has probably been covered ten thousand times, but this version is a slightly sped up, rockabilly-tinged blast. No messing around with hooks, or melody, really, this song is just a stream of consciousness political poem. Cobra Skulls do it justice and add a fantastic pause between a set of verses that really accentuates the manic nature of the song. I like it.